Fall officially started this week and here I am writing about tomatoes. I promise I’ll have a very fall recipe next week. In the mean time, let’s talk about tomatoes and this warm cherry tomato panzanella. Panzanella is basically a tomato and bread salad. Normally, it uses raw tomatoes but here sweet little cherry tomatoes get a short sauté in a hot pan until they just start to burst. Then they’re tossed with some toasted bread, onions, white wine vinegar, and olive oil. The short sauté brings out the juiciness of the tomatoes that mingles with the vinegar and olive oil to make a tasty tomato vinaigrette. As if that wasn’t enough, it all gets served on top of some seared prosciutto wrapped chicken cutlets. 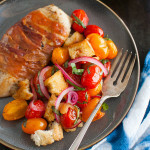 My husband and I love this dish with the panzanella piled high on top of the chicken so that the chicken picks up the flavors of the tomato vinaigrette. For the kids, however, I serve everything separately. My older daughter finds the vinegar to be too acidic for her taste and she likes the bread to stay crunchy. So, I set aside some of the croutons for her before tossing the rest with the salad and I try to serve her salad with as little vinaigrette as possible. My younger daughter doesn’t like tomato chunks of any kind but she likes the vinaigrette. So she gets a little sauce dish of vinaigrette that she uses as a dip for her chicken. Now that I’ve managed to squeeze in one last summery recipe (it was too good to wait all the way until next year to share), let’s bring on the pumpkin recipes! Combine onion and white wine vinegar in a small bowl. Season with a pinch of salt and pepper; set aside. Heat 2 tablespoons olive oil in a large skillet over medium-high heat. Add bread pieces; sprinkle with some salt and pepper. Cook, tossing, and adding more olive oil as needed until bread pieces are golden brown, 5-8 minutes. Transfer croutons to a medium bowl; set aside. Wipe out skillet. Using a thin, sharp knife, slice chicken breasts in half horizontally. You should end up with 4 thin chicken cutlets. Season chicken with salt and pepper. Lay 2 slices of prosciutto on a work surface overlapping the long edges slightly. Place one chicken cutlet crosswise in the center of the prosciutto slices then wrap the prosciutto around the chicken; repeat with remaining chicken cutlets and prosciutto. Heat 1 tablespoon olive oil in a large skillet over medium-high heat. Add 2 wrapped chicken breasts to the pan, and cook until golden brown and nearly cooked through, about 4-6 minutes. Turn and cook until cooked through, about 4-6 minutes more. Transfer to a platter. Repeat with remaining 2 cutlets and 1 tablespoon olive oil. Transfer chicken to the platter. Cut half of tomatoes in half. Heat 2 tablespoons olive oil in same skillet over medium-high heat. Add whole tomatoes; season with salt and pepper. Cook, tossing occasionally, until tomatoes are lightly blistered and starting to burst, about 5 minutes. Add cut tomatoes, pinch of sugar, and 1 tablespoon of the vinegar from the onions. Give everything a quick toss and then transfer tomato mixture to the bowl with croutons. Add pickled onions with pickling liquid, basil, and 2 tablespoons olive oil and toss. Serve chicken with panzanella spooned over. Recipe adapted from Bon Appétit, July 2015.